The Terrestrial Ecosystems Research Group has established a major transect to monitor intact ecosystems vulnerable to changes in climate, sampling environmental gradients relevant to climate predictions for the near future. The Terrestrial Ecosystems transect spans strong temperature and rainfall gradients, as well as a wide range of ecosystems. These ecosystems are of interest because they contain unique organisms that occur nowhere else and might be vulnerable to changing environmental conditions. The Group aims to detect regional patterns and trends by researching a combination of species composition and change, shared distribution patterns, morphological variation and genetic variation. By understanding the adaptive capacity of species, TREND aims to predict where target species will persist under drier, warmer conditions. The work of the Terrestrial Ecosystems Research Group is closely aligned to government policy. 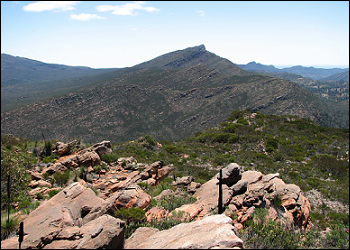 The transect ranges from the Deep Creek, at the tip of the Fleurieu Peninsula, through the Mt Lofty Ranges to Warraweena in the northern Flinders Ranges, following a similar route to the Heysen Trail, allowing monitoring of ecosystems potentially most vulnerable to climatic shifts. With monitoring and analysis to cover the wetter central Mount Lofty Ranges north to the hotter and drier Flinders Ranges. Over one hundred long term systematic monitoring plots have been established along the transect. Monitoring is compatible with nationally standardised methods proposed for the Terrestrial Ecosystem Research Network (TERN) but include data collection designed specifically to answer questions relevant to TREND. In addition, molecular analysis of species which occur along the transect will provide data on genetic structure, connectivity and adaptive capacity. The Terrestrial Ecosystems Research Group aims to detect regional patterns and trends by researching a combination of species composition and turnover, shared distribution patterns, morphological variation and genetic variation. Where possible, sites are co-located with previous Biological Survey of South Australia sites and the data analysed against original survey data dating back 20-30 years. 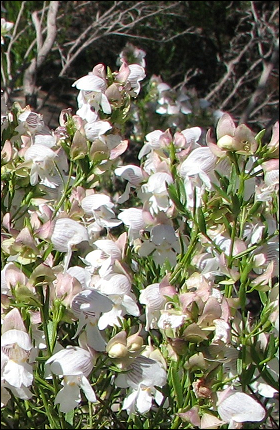 To test how ecosystems might respond physiologically to changes in climate, the biochemical responses of individual plant species as well as soil microorganism communities are being investigated along environmental gradients, with the aim of identifying genes involved in responses to environmental conditions. By understanding the adaptive capacity of species, TREND aims to predict where target species will persist under drier, warmer conditions. Click here to see the location of the terrestrial transect in South Australia.